As usual, it’s taken me a while to get all my photos and videos from the Santa Special season edited and organised. Mind you, mid-January is a definite improvement over March, which is how late I was last year! 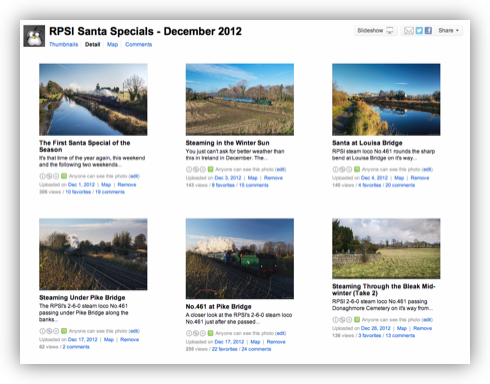 As usual, the Railway Preservation Society of Ireland (RPSI) ran two Santa Specials a day from Dublin to Maynooth to Dublin on the first three weekends of December. 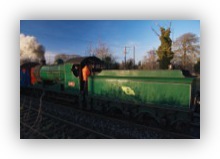 The trains were all scheduled to be hauled by the societies recently overhauled 2-6-0 steam loco No.461, which has been painted in the beautiful old CIE green livery. The same loco had been scheduled to run the 2011 trains too, but she was not ready on time, and all the 2011 Santa Specials from Dublin had to be hauled by diesel locos instead. Having missed the Santa Specials No.461 went on to make a decidedly unreliable return to steam over the spring and summer of 2012. Apparently No.461 took a while to bed in after her previous overhaul too, but apparently she did become very reliable over time. Hopes were high that she’d prove herself with the Santa Specials. She almost made it through the whole season, but the last two days proved too much for her, and the final three of the twelve trains had to be hauled by diesel locos. Unfortunately my health proved to be even less reliable than No.461, and caused me to miss three out of the six days, and hence six out of the twelve trains. The weather for the first day of the 2012 Santa Special season could not have been better with beautiful clear blue skies all day. In the morning I was waiting for the outward leg of the first train at Pike Bridge just east of Maynooth, and I caught the return leg at Matt Goff Bridge just next to Intel Ireland in Leixlip. 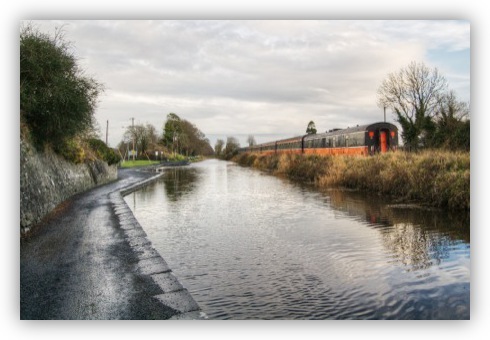 Because there is no turntable in Maynooth anymore, the return legs from Maynooth back to Dublin have to run tender first (i.e. with the loco facing backwards but at the front of the train). 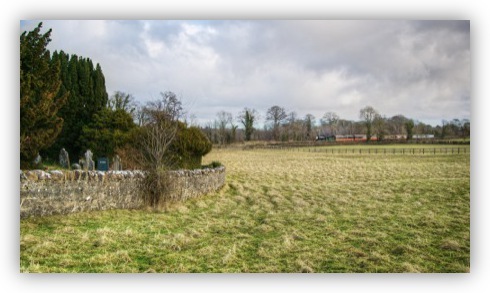 In the afternoon I headed for Leixlip, meeting the outward leg at Louisa Bridge on the western edge of the village, and then headed back towards Maynooth to meet the return leg at Donaghmore Cemetery near Pike Bridge. My favourite shot from the day was probably the one taken at Louisa Bridge which I’ve included below. The shot needs a black background to really shine, so click on the image to see it large and on black over on my Flickr stream. On the second day I had the start of what would turn out to be a very nasty cold indeed, but I felt well enough that I would have gone out had the weather been OK, but it wasn’t. It was cold and wet all day, so I decided to play it safe and stay home here it was warm and the dry. By the time the weekend of the third and fourth day rolled around the cold that was just starting on the previous Sunday had turned very nasty indeed. I was so miserable that I didn’t feel up to going out and shooting even though the sun shone all day. Thankfully I was over my cold by the final weekend of the season, and was very keen to get out there with my camera. On the Saturday morning I decided to try out a new location, and set myself up in a field next to the beautiful old cemetery at Donaghmore near Pike Bridge. The weather forecast had been for a beautiful sunny morning, but alas Met Eireann got it wrong, instead it was dull, overcast, and very windy. The shot I was able to get was beautiful, but very bleak. Most of my train shots have a happy colourful feel, this one is very different. Bleak though my first shot was, it did show that the location had promise, so I resolved to try again the next day. 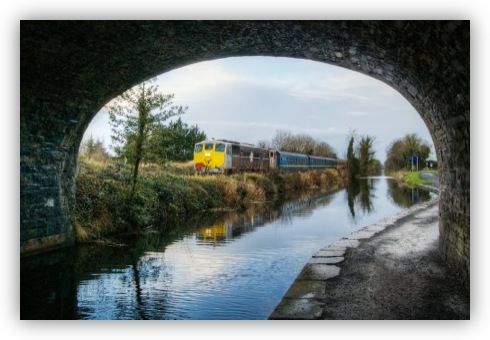 For the return leg that morning I moved the short distance to Pike bridge, where I could get a good view of the train passing under the bridge and past the small harbour on the Royal Canal located just east of the bridge which served Carton Estate, the seat of the Dukes of Leinster. I didn’t know it at the time, but this would be my last view of No.461 in 2012. That afternoon I was hoping to get my first shot of a steam train at milepost 13. 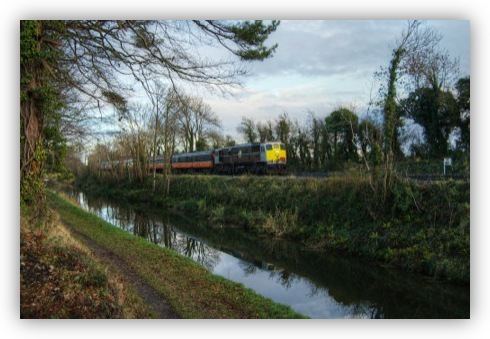 This is a location that only became usable this year when Waterways Ireland cleared a lot of the trees and bushes that had blocked the view of the railway line along this part of the Royal Canal. The train was late, and as the delay got longer and longer I started to fear that No.461 had run into trouble. Sure enough, about half an hour after the train was due into Maynooth, a single headlamp appeared in the distance without any accompanying clouds of steam. Soon the distinctive sound of an Irish Rail 071 class diesel broke the silence, the train was being pulled by loco No.083. This was my first shot of a diesel loco at milepost 13, so I still got a first, just not the one I was hoping for. For the return leg I moved to Matt Goff Bridge in Leixlip again, but because of the delay in getting to Maynooth the return leg was also delayed, and the short winter day had run out of good light before the train arrived. The morning of the sixth and final day of the season started off fantastically, the sun was shining in a clear blue sky, and it was even quite warm for a December day in Ireland. 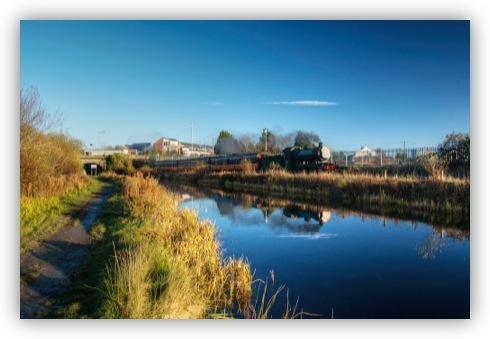 Having decided that my new location at Donaghmore had potential, I headed back to capture a train in the sun. I was hopeful that perhaps No.461 could have been repaired overnight, but I wasn’t surprised when another 071 class diesel loco came into view instead, No.076 this time. For the return leg I headed to Blakestown level crossing at the 13th lock on the Royal Canal. 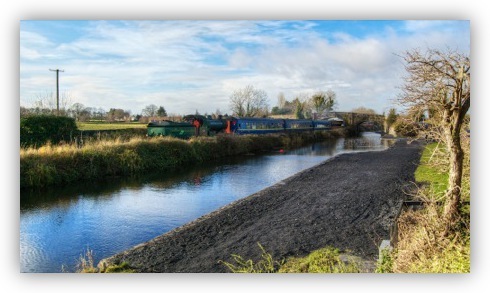 I set up my camera along the banks of the canal just beyond the level crossing the the lock, where there is an uninterrupted view along a very picturesque section of the canal. 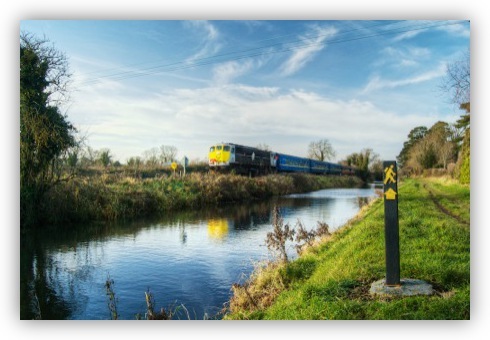 I was able to use a hiking signpost for the Royal Canal Way to add foreground interest to the shot. Conveniently, the little man on the sign was painted on in almost the same shade of yellow as the speed limit sign next to the track and the front of the loco. By the afternoon the weather had completely turned. It was raining so heavily that I didn’t think I’d be able to get any shots at all, but just as the train was due the rain died down and the sun even came out for a few minutes. It turns out the very bad weather was a blessing in disguise, providing simply superb storm light, and even a subtle hint of a rainbow! 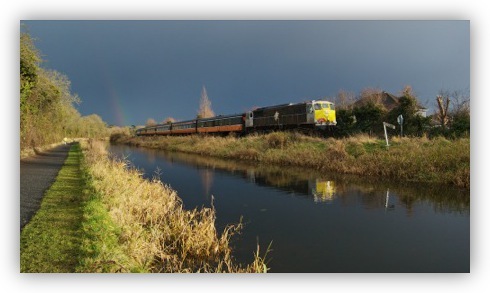 The weather continued very showery, so I decided to play it safe for the return leg, which would be my last opportunity to photograph a special in 2012, and set up my gear under Pike Bridge. This allowed me to use the bridge both as shelter, and to frame the train as it approached. I could also get a second shot by running out the other side of the bridge to catch the back of the train as it vanished off into the distance. The first shot worked really well, and is my favourite shot from the season by far, and I quite like the other shot I got too. I’ve included both shots below.